The surprise announcement by Sen. James McClure that he will not seek a fourth term had an earthquake-like effect on the relatively stable structure of Idaho's congressional politics. See a list of all High Country News articles published in 1989, categorized by subject. 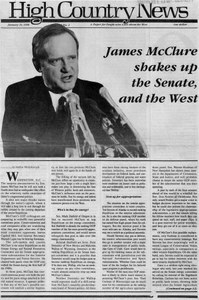 Even as McClure stood firm on his values, he tried to work with his adversaries, and for that reason he was effective on many issues. "What I didn't know about then was the peculiar world of bureaucracy. It thinks even nature must bend to what bureaucrats decide is best."